2 x Root Control Discs - the RCD's are placed in the tray under each pot, gold face up. The RCD's will prevent roots from leaving the pots and discourage them from heading towards the AQUAvalve. 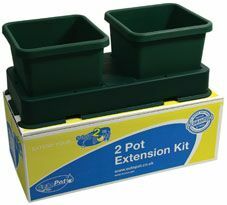 1 x single AQUAvalve with the 2Pot Extension Kit is placed in between the pots. 1 x 6mm Tee for easy connection to the easy2grow Kit or existing systems.